The boys' school had their Buwan ng Wika culminating activity last Friday. 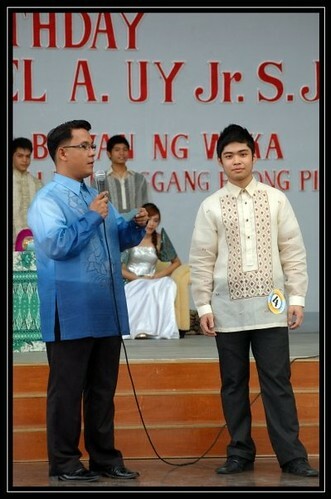 It was the same day too that Matthew competed against 13 other boys for the Lakan 2009 title. What does it take to be a Lakan? 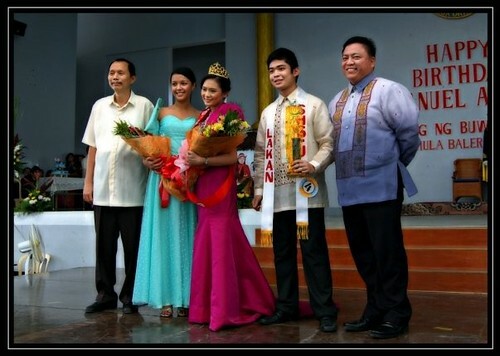 One would have to have the total package: looks, stage presence, and ability to express your views in fluent Pilipino. Filipino is the language or dialect that is least spoken in our household in Cebu. Though I speak fluent Filipino (being born and raised in Manila), mostly it's Cebuano or English. Filipino fares just a notch better than Jerry's Chinese dialect, Fookien. So imagine my amusement at first knowing that Matthew was to compete with other high school boys. And imagine my surprise even more when he emerged the winner! (These photos were swiped from the album of the boys' teacher friend. See the rest of the pics here). arlenee!!! maraming salamat! :) hehehe.